'Animated Page Transitions' for concrete5 brings animated page transitions to your website with the click of a button. 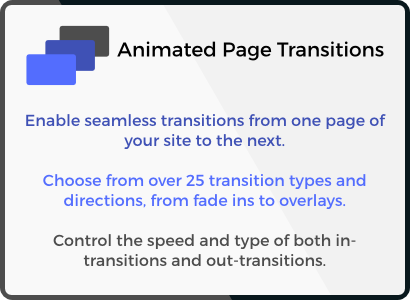 It offers a range of transitions to choose from to animate pages in and out whenever your website is navigated. Options include setting the animation types for when loading a page or leaving a page, overlay color (for when using an overlay transition type), and the speed settings for both in and out animations.